Physical characteristics: Male satin bowerbirds have iridescent (lustrous appearance) black plumage, bright lavender eyes, pale yellow bill, and light legs. 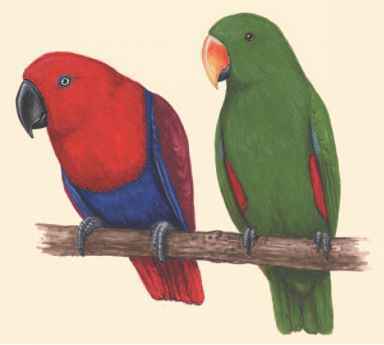 Females are slightly smaller than males, with green, gray-green, brown, and buff colorings that help to camouflage them (blend into the environment). Adults are about 13 inches (33 centimeters) long, with females weighing between 0.38 and 0.57 pounds (170 and 258 grams) and males weighing between 0.38 and 0.64 pounds (173 and 290 grams). 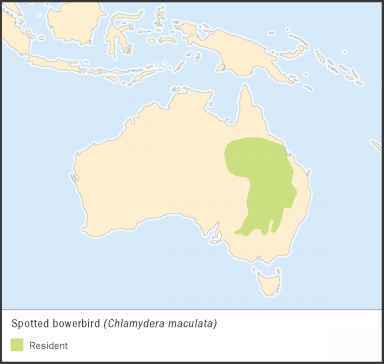 Geographic range: They are found in eastern and southeastern Australia. Habitat: Satin bowerbirds inhabit rainforests and eucalypt forests, clearly preferring forest edges and nearby woodlands with dense sapling understories. During winter months, they like more open habitats such as pastures and urban and suburban areas. Diet: Their diet consists mostly of fruits but also some insects. They also eat flowers, leaves, herbs, nectar, seeds, and animals including cicadas, beetles, and other arthropods. Satin bowerbirds forage from the forest canopy during summer, but eat from the ground in winter. Behavior and reproduction: Males clear off a circular area on the rainforest floor and build avenue bowers to attract females. They are usually built about 990 feet (300 meters) apart when along rainforest edges, but are spaced further apart in rainforest patches and woodlands. Decorative bluish and greenish yellow objects such as flowers, fruits, parrot feathers, snakeskins, snail shells, and human-made objects (such as pen caps) are often used. Bowers are used from late August/September through December (peaking in October). Adult males make their presence known with a clearly-whistled "quoo-eeew," various harsh and scratchy hisses (called "skraa" calls), and vocal mimicry, often sung within the understory above his bower. 7 to 130 feet (2 to 40 meters) off the ground. 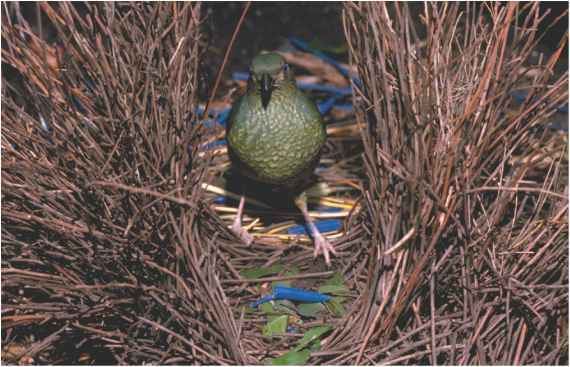 Nests are made with sticks and twigs and lined with green and dry leaves. Females lay one to three colored and blotched eggs. The incubation period is twenty-one to twenty-two days. The nestling period is seventeen to twenty-one days. Satin bowerbirds and people: Male satin bowerbirds often remove people's jewelry, keys, and other items in order to decorate bowers.